After having one last walk around I packed all my stuff together and caught the tram to the Central Station, making use of the last few notches on my Strippenkart. At the station I bought my ticket to the charmingly named Schiphol airport. Getting off the train at Schiphol, I found the terminal and checked in, then strolled about having a look around. Like most airports, it was shiny and new looking, as though it had just been renovated. Now, a question for you, dear reader. If you were about to get on a plane out of the Netherlands, and a woman you’d never met before offered you a packet filled with small white pills, would you take them? Okay, how about if the woman was inside the airport check-in area within full view of numerous police, wearing an airport uniform with ID badge, the packet was marked “Amsterdam Airport Schiphol peppermints”, and she was handing a packet to everybody? Yes? Well, the peppermints were very nice, anyway. The short flight back to London was pretty relaxing, and the weather was glorious so I watched the clouds going past outside. It was a fairly small plane, and when we landed, we didn’t even get a gantry thing to walk along, we just stepped down onto the runway and walked to the terminal along a ragged green carpet. I could’ve done a Pope and kissed the ground, but decided not to. After picking up my luggage and clearing customs I went and found the railway station and caught the Gatwick Express train into London. Gatwick Express have some very funny advertising, featuring a cartoon Queen Victoria (their trains go to Victoria Station in London) with air traffic control paddles, and another one flying like Superman. I caught a tube to King’s Cross and found my home for the next few days, the YHA St Pancras Hostel. It was in a brand new building, only a few months old – perhaps a bit less friendly than some of the older hostels I’d stayed in, but very comfy. I dumped all my stuff and headed out again, catching a Northern line train to a station called Bank. Then in the manner familiar to anybody changing trains in the London Underground, walked up and down steps and corridors and around corners and along more corridors to the Docklands Light Rail station. The DLR is a mostly above-ground railway built in the 1980s to serve the newly-redeveloped docklands area of London. The train rolled along happily through the Docklands, and I took the opportunity to get a seat right at the front, where the driver would have been if there had been a driver. We got to the very exotic-sounding Island Gardens, the end of the line, and I walked out of the station and followed the signs to the Thames. From Island Gardens, to get past the Thames to Greenwich, you have to swim. No, that’s not quite right, actually you take the Greenwich foot tunnel, a pedestrian tunnel that looks like it was built about a hundred years ago (which is because it probably was), with a huge decorative entrance at each end. It would undoubtedly be terrific exercise to walk the tunnel each way every day, skipping down the steps, walking the few hundred metres under the river, then staggering up the steps at the other end. I strolled around the streets of Greenwich, stopping for a Walls Magnum ice cream, which tasted more-or-less identical to the version at home: the Streets Magnum ice cream. Then I made my way up the hill towards the Observatory. It was almost 16:30 GMT (har har). The Observatory closed at 5pm, and while I was debating with myself whether or not to pay the five pounds and go in, the decision was made for me, as they closed the doors. No matter, I pottered around outside, checking out the standard British measures on display on the wall, and looking at the brilliant view over London from the top of the hill. I’m sure the stuff in the Observatory is very cool, but anybody who finds themselves there with a limited amount of cash or time, and just wants to look at the all important line splitting the eastern and western hemispheres of the world, should know that although most of the line is within the Observatory grounds, it actually keeps going for a few feet outside the fence, and is accessible from a path just north of the Observatory. I stood on this line, one foot on each hemisphere. And then with Homer Simpson in mind, alternated standing in the east and west. “East!” “West!” “East!” “West!”. More amused by this than I probably should’ve been, I strolled back down the hill and found Greenwich station, and caught a suburban train back into London – to London Bridge to be precise. Most people probably know that London Bridge (the one that fell down in the nursery song, and which also got sold a few years ago and re-assembled in Arizona) is not the same as Tower Bridge (the one in all the postcards). But it’s not far away, and I walked beside the Thames towards it. I walked under the bridge and had a quick look at the area just east of it, full of renovated warehouses and alleyways. It looked quite staggeringly like the area where the Doctor Who story “Resurrection Of The Daleks” had been set, which if I remember rightly was somewhere very near the Thames. I didn’t see any burnt out Dalek shells though, so I headed up and over the bridge. 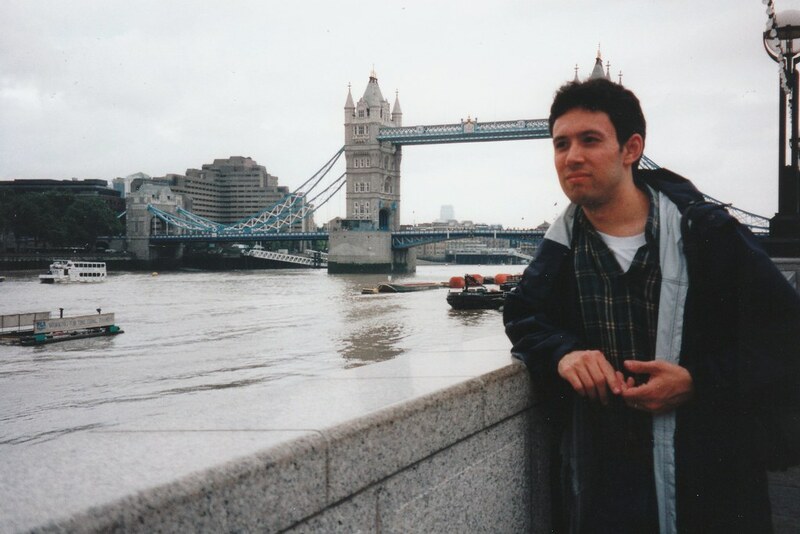 Standing by the Thames, part of Tower Bridge sticking out of my head, and wondering what I should do with my hands. Like a lot of things, Tower Bridge looks bigger in real life than it does in pictures. Not as big as the Sydney Harbour Bridge, but big. What was surprising to me though was that it only had one lane of traffic each way. Heaps of pedestrians though. Looking over at the Tower Of London, I realised that Tower Bridge is probably named after the Tower, rather than the towers the bridge itself has. I walked around by the Tower, which was closed for the day, and looked aghast at the adjacent McDonalds – complete with McDonalds merchandise shop. I headed back to the hostel and lounged for a while in the errmm… lounge. My friend Naomi had been due to arrive in London while I had been in Amsterdam. I phoned her where she was staying and she said “yeah, c’mon over for dinner. Tony’s late getting home, so it’ll be a bit late.” And she gave me directions to Tony’s place, which I scribbled down on a scrap of paper and stuffed in my pocket. Step 1: Catch the Piccadilly line to Wood Green. Okay, no problem, very easy. Step 2: Cross the road, go left, and find the bus stop to catch a 329. Ah. This is a problem. When I come out of a tube station, my sense of direction is completely shot due to climbing numerous sets of stairs up to street level and having turned around several times in the process. Not to mention having spent most of the week in Europe, and having just got accustomed to traffic going in a particular direction being on the other side of the street. I wandered through the crowds (London has the busiest suburban streets I’ve ever seen), looking for a 329 bus stop. I found one, and as luck would have it, a 329 approached. Reading my scrawled instructions, and realising I didn’t actually know the suburb I was heading for, I asked the driver if he was heading past any Tesco Express stores (which was the landmark for the stop I had to get off at.) He thought I was heading in the wrong direction, and sent me over the road to the other bus stop. I and seemingly a hundred other people piled onto a northbound 329. It was probably more crowded than most buses in Melbourne I’ve been on, though the St Kilda Road trams in peak hour would beat it. I found a seat upstairs and kept my eyes glued to the windows. Step 3: When you see a Tesco’s Express, get off at the next stop. The street is back the way the bus came from, on the left. The bus rumbled through the dark and narrow north London streets. After a while, I saw a Tesco’s go by. I pulled the cord and got out. I looked around. The street I was looking for wasn’t there. I checked again. It still wasn’t there. “Can you see a pub?” asked Naomi. “Get back on the bus”, she said, and told me which pub to watch out for, the Green Dragon. Fortunately even after dark this bus route ran every eight minutes, and it wasn’t long before I was back on board, watching out for not a normal Tesco’s, but a Tesco’s Express. To this day I’m still not sure what the difference is, but I found it, and once again got off the bus. I went up and found her and her friend Tracey, another bloke also visiting London, and when Tony eventually got home from work it was introductions all round, and we settled into a brilliant roast dinner, courtesy of a SENSATIONAL cooking effort by Naomi. Actually she told me to say that, but it’s an accurate assessment. We chatted over dinner and wine about whatever sprung to mind, a lot of discussion revolving around war memorials and related topics, something which Tracey and Tony obviously had a mutual interest in. At around a quarter to twelve I had to make a move to get back into London, before the tube stopped and I was left with the expensive option of getting a cab back or the moderately confusing option of finding where on earth the Night buses went. So Tony drove me to the nearest tube station at Southgate, which if you ask me is an odd name for somewhere north of London. He actually drove past the station looking for a place to stop, not wanting to stop anywhere improper because there was a police car right behind him. In the end he did a U-turn and came back and let me out. I thanked him profusely for the hospitality and the lift, and went over to the station, where I found a stopping area especially for picking up and setting down passengers. D’oh! I went into the station. It was about midnight and most of it was dark. I looked around for the platform for London. “Where you going, mate?”, a cheerful London Underground woman asked. “Thanks.” I went down the escalator with some speed, and a couple of minutes later the train arrived. A few people were on board, but plenty of seats, and the train carried on into London, greeted at each stop by an Underground person with a green lantern to signal the train on when everybody was aboard. At one stop the train waited a minute, while the bloke bellowed down the corridor, “‘Urry up! Last train!” to some latecomers. We got to King’s Cross and I alighted, walked back to the hostel, made more noise than I would have liked getting into bed, and dropped off to sleep.